Since the 1990’s, most practitioners in the field of leadership development have been guided by leadership growth models which map six or more key transitions that leaders must navigate to successfully rise to greater heights and scope of responsibility The concept of Leadership Transitions³ is an extremely useful model to: 1) clarify talent requirements by role or level within an organization, 2) identify future leaders, and 3) assess their competence, plan their development, and measure results. In the past 20 plus years of global executive education design and delivery, this framework has served as a central operating model. It helps leaders focus and develop the mindsets and skillsets that must be developed to progress forward on a career path, as well as to add greater value to the organization. However, as useful as a leadership transitions framework of any sort is, it essentially sees growth as a linear progression, primarily building cognitive capabilities, adding new skills, and awareness of new work values anchored in an ever-widening scope of practice. What we have found, in practical reality, in hundreds of executive education programs and executive coaching engagements, are two things: Leadership growth is not as linear as we might think, and linear development is no longer enough. The idea of linear growth prevails in Western culture, as evidenced in our notions of biological evolution, the continual advancement of civilizations, and in the way we organize formal education. Progression may appear orderly as we ascend levels of leadership, very much like the building blocks mastered when moving from childhood to adulthood or from simple math to calculus. Once you learn fractions or percentages, for example, it no longer presents itself as a problem. Each step is a building block for the next step. From a very early age on, we learned that once we understand or resolve something, we move on to the next thing. Leadership, however, as we explored, is not an orderly linear routine, but a collective practice and process of transformation. We do not “get the learning once” and never face the same challenges again, at a more complex level. We do not graduate from one set of difficulties to another. Advancement is not measured by leaving behind old problems and working on new ones. In fact, as we progress in leadership, it’s much less about solving problems (as our education system trained us to do) and much more about managing paradoxes, or the tension of opposing forces that must be kept in dynamic equilibrium together: drive growth AND manage costs; deliver short-term AND long-term performance; execute AND engage others at the same time. We come up against the same challenges repeatedly, only at more complex levels. Progress is indicated by upward movement or expansion of thinking. As we advance, we may believe we have overcome some challenge, and yet there it is again, only subtler this time, and the response that is called for is much more nuanced. But with altitude, we see these challenges from a broader perspective, and integrate feedback from earlier experiences to modify our approach to the current challenges. It’s an ongoing, continuous and dynamic process. This spiral of growth happens at both an individual and collective level, and yet we can choose to resist the upward expansion. There is often an unconscious resistance to change, since the deeper, primitive and mammalian areas of our brain were designed to protect us. When any change in our forward progression takes us out of our comfort zone, our brain sends out a signal which we experience as doubt and fear. Our brain interprets this signal as a potential sign of danger or a threat, and it sends out a jolt of epinephrine prompting us to steer back to our old set-point. This is called the psycho-cybernetic mechanism. It’s like a thermostat—a kind of autopilot that will always kick in and seek to protect you, keep you out of danger… which unintentionally can keep you from advancing forward up the spiral of growth. At the same time, the groups we are part of also tend to maintain the status-quo in mindset, behaviors or skills and resist change. A group typically has a dynamic that develops reinforcing habits to keep things static – basically staying within a “collective comfort zone”. In order to maintain this comfort zone, human groups and our individual brains use feedback loops in which each part of the system provides information to the other parts of the system, which then adjust accordingly. That is, leaders and the group will influence each other with their reinforcing behavior – healthy or imbalanced – holding a group in status quo position. If we wish to navigate through these built-in neural mechanisms maintaining the status quo and move up the spiral of growth, we must consciously seek to rewire our brains for exponential adaptability. At an individual level, scientists have shown that we replace limiting thoughts with positive, expansive thoughts and control the constant chatter in our brain’s default state through trained focusing techniques. We can literally strengthen the brain’s chemistry, structure, and functioning, enabling us to achieve more, faster. In fact, we can actually cause neurons to fire in different ways that support positive growth and behavioral change. In this way, we can use the natural feedback loops in our brains and human groups to drive upward progression on the spiral of growth or scarcity vs. abundance mindset. At the group level, our experience is that moving beyond a set point to expanded levels of play can begin through multiple entry points. 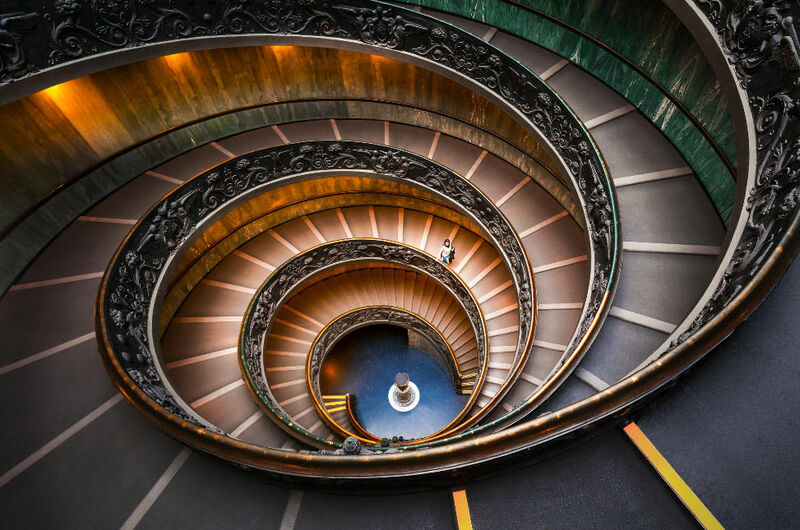 If change is required, it doesn’t matter where you begin to examine and transform the imbalances or ineffective behaviors – anyone in the system can begin to change the habits and drive movement forward, up the spiral of growth. Coaches, for example, can help leaders identify: 1) changes necessary for more effective leadership results; 2) behaviors they are willing to change; and 3) others who can also facilitate behavioral changes in the group or organization. As new mindsets and behaviors are practiced, feedback loops from various members in the group provide reinforcement of new neural functioning and strengthen the collective ability to respond to exponential change in a healthy manner. Linear development is no longer enough – Growth happens with addition, subtraction and multiplication. When faced with the pressure of rapid disruption and exponential change, many leaders seek to “add on” new skills, new approaches to the increasing pace and challenges. This is a linear, step-by-step additive approach to development. While buttressing ourselves with new knowledge, skills and awareness will assist us in navigating the constant barrage; it’s no longer enough. Research4 shows beyond adding new skills and knowledge, we must expand our way of thinking. In our experience, that means we must subtract or let go of outmoded beliefs and embrace principles that will positively multiply or accelerate the collective ability to create new responses. Let’s first explore the subtraction of old ways of thinking. When we feed ourselves disempowered, limiting or stressful thoughts grounded in old ways of coping, recent brain studies using MRIs and other tools have shown the dramatic impact on our brain. Extensive research5 has been done on the effect of stress on the hippocampus, which makes connections among other parts of the brain, and is also one of the few regions able to produce new neurons. Unfortunately, the hippocampus is also highly sensitive to negative stimuli. These studies have shown that exposure to a stressor — such as continually thinking negative or limiting thoughts about our chances for new results in work and life — for more than 30 minutes at a time — leads to elevated cortisol levels that hamper synaptic connections and speed up cell death. Over time, repeated bouts of limiting beliefs, negativity, criticism, or judgment will cause the hippocampus to shrink, resulting in declines in cognitive function, including the ability to retain information and adapt to new situations. In fact, in one study conducted with both corporate executives and leaders of startups6, the entrepreneurs were able to embrace conflict and switch to the part of the brain that moves into creative problem-solving more quickly than executives of legacy organizations who had hard-wired restrictive beliefs about what was possible. 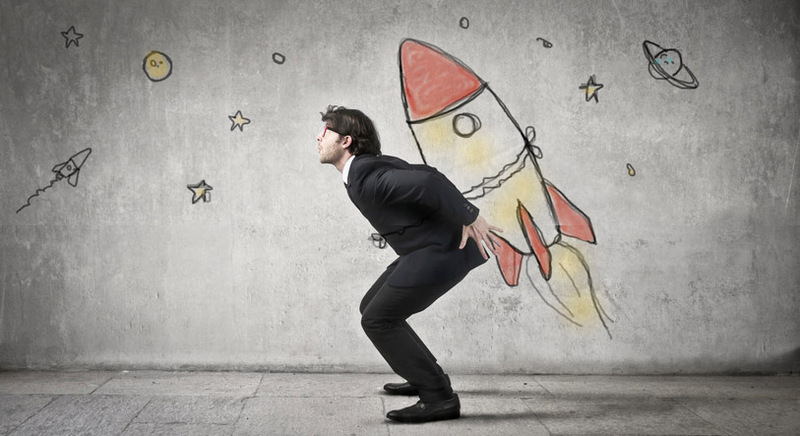 Those leaders who can move beyond limiting beliefs and switch more rapidly and easily between exploration [creating new approaches, products or processes] AND exploitation [improving the quality of existing approaches, products or processes] and back again are those who perform and innovate the best. So, here’s the thing: With repetition of limiting, often unconscious, stressful beliefs in the face of disruption, we actually weaken our own ability to cope with change, process new information and progress. If we want to keep pace with exponential change, we literally need to consciously and proactively excavate and release old beliefs that limit our way forward. Slowing down is vital to reflection on how we originally “learned” the beliefs, attachments and preferences to begin with. This then helps us think about how to let go and “unlearn” for new circumstances. The good news is that with awareness and tools about how we can “use our brain to change our brain”, we can consciously use coaching, practice, and debriefing to accelerate unlearning and relearning for the exponential age. Beyond releasing, subtracting or letting go of older beliefs that hinder our way forward, we can also train our brain to multiply or accelerate our ability to relearn and become more exponential. Relearning can be accelerated by directing our focus to positive, expansive thoughts and images. In doing so, the brain’s chemistry, structure, and functioning all strengthen, enabling us to achieve more, faster. That means we can actually cause neurons to fire in different (exponential) ways that support positive growth and change in our lives. Whenever you learn something new, or create a new intention, a new grouping of cells comes together to form neural associations between them. When you hear certain words or see certain images, and respond to what you see and hear in different ways, for example, your brain automatically forms new associations. With repetition or practice, these connections thicken and strengthen, meaning the behavioral response is more likely to be repeated. With each association, there is actually a tiny bit less electrical resistance to that thought, which makes it easier and easier to have. In this way, the exponential leader can become more effective in decision making and leading others by using both sides of their brain. By utilizing both the left brain (logical – learning by instruction) and the right brain (reflective – learning by experience), leaders can accelerate their thinking and behavior quicker than mere linear thinking. Of course, leaders and their groups experience discomfort when they are adapting their neural pathways from old ‘habits’ to more effective ones. This is a natural process of human adaptation. But new knowledge about neuroplasticity means that we can actively shape our brains and accelerate our own development through empowering beliefs, visualization and practices. Bottom line, in the face of constant disruption, the old approach of linear, additive growth is no longer enough. What we call empowered, whole-brained exponential thinking strengthens our brain’s chemistry, structure and functioning by releasing beliefs that hinder our progress and then anchoring into patterns of thought that accelerate us forward. To jump the curve from linear to exponential thinking, we believe leaders must combine unlearning (subtracting) and relearning in an accelerated manner (multiplier effect). 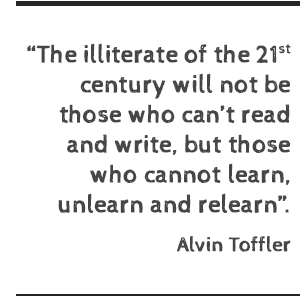 As Alvin Toffler predicted, “The illiterate of the 21st century will not be those who can’t read and write, but those who cannot learn, unlearn and relearn”. 3 Originally based on career development research and furthered significantly by Ram Charan, Stephen Drotter, and James Noel, in their seminal work, The Leadership Pipeline, Jossey-Bass, 2000 and 2011, additional research around Leadership Transitions has been conducted by the Center for Creative Leadership, the Corporate Executive Board and other organizations. 4 A good summary of the research in this area is: Nick Petrie, “Vertical Leadership – Part 1: Developing Leaders for a Complex World”, Center for Creative Leadership, 2014. 5 See, for example, the National Geographic and PBS documentary, Stress: Portrait of a Killer, (2008) by Dr. Robert Sapolsky. A leader in research on the effect of stress on the brain, Sapolsky is a Professor of Biological Sciences at Stanford University and Professor of Neurology and Neurosurgery in Stanford’s School of Medicine. This article is the second in a 3-part series from a white paper entitled HOW CAN WE DEVELOP LEADERS FOR EXPONENTIAL TIMES? authored by Karen Walch, PhD and Lee Ann del Carpio, and used with permission from CLAIR-BUOYANT™ LEADERSHIP, LLC AND INNER POWER INTERNATIONAL, INC.